Single-mother families struggling in Mass. No vacations: Anne Desjardins (left) and son Messiah Ambrose. Relying on aid: Keri-Ann Aubin (right) and son Kevin Ranney. An estimated three out of four female-headed households in Massachusetts don’t earn enough to pay bills and raise their children, according to a Boston nonprofit that is releasing a report Thursday on the income families require to meet their basic needs. 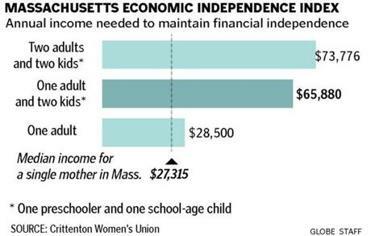 In Massachusetts, a single parent with one school-age child and one preschooler needs to earn at least $65,880 a year to pay for food, housing, transportation, child care, health care, and other household expenses, Crittenton Women’s Union reports in its Massachusetts Economic Independence Index. The difference between what people make and what it costs to support themselves is getting wider as costs go up, wages stagnate, and more jobs require higher levels of education and skills, according to Crittenton, a 189-year-old institution that conducts research to help low-income women gain financial independence. This gap is not found only among single mothers: The organization estimates 4 of 10 two-parent households in the state do not bring in enough money to make ends meet. “You get into what our families sometimes call the gerbil wheel,” said Elisabeth Babcock, president of Crittenton. “They’re working at low-paying jobs. Minimum wage doesn’t begin to cover the costs of supporting a family, and the only way they can earn enough is by getting more education. 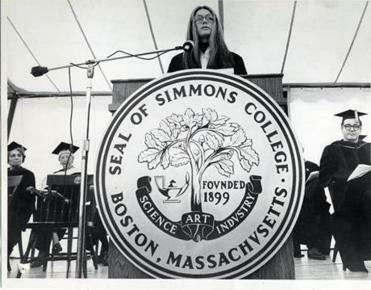 Forty years after delivering the commencement address at Simmons College, the political activist returns to speak about feminism. Crittenton, the largest women’s service organization in Massachusetts, has produced its triennial economic independence index since 2003. It includes an online calculator where people can enter their cities and ages of their children to see what they need to earn to cover expenses. In Dedham, for example, a single parent with a school-age child and a preschooler needs to make $74,772 a year; in Pittsfield, it’s $53,544. About 25 percent of Massachusetts households with children under 18 are headed by single mothers, according to the census. The median income for households led by single mothers in the state is just $27,315 a year — an amount that Keri-Ann Aubin of Easthampton knows is not nearly enough to support a family. She also knows a college degree doesn’t guarantee a living wage. Aubin went back to school after her children were older and graduated from Smith College in Northampton in 2006. But she earns just under $27,000 as a full-time staff writer at a newspaper and relies on subsidized housing, fuel assistance, and food pantries to support her two teenage sons. The Crittenton report echoes the findings of other reports. More than 10 million families in the United States — nearly a third of all working families — don't make enough to meet their basic needs, according to the Working Poor Families Project, a national initiative dedicated to workforce development policies. And the number of low-income families is on the rise, even as the economy sputters back to life. In Massachusetts, the gap between rich and poor is among the largest in the country. The state’s poverty rate is below the national average, but when regional living expenses are factored in, Massachusetts has the 10th-highest rate, according to the Center for Law and Social Policy. 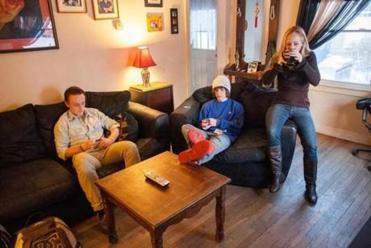 Keri-Ann Aubin, mother of teenagers Steven Ranney (left) and Kevin Ranney, struggles even with a Smith College degree. The state’s transition from an industrial to a knowledge-based economy is one of the reasons more working families are struggling, according to the Massachusetts Budget and Policy Center. A few decades ago, when manufacturing jobs were plentiful and unions were stronger, workers with just a high school diploma could find jobs that paid enough to support a family. Even six years ago, more than half of in-demand jobs that paid self-sustaining wages could be filled by workers with a high school diploma, according to Crittenton’s Hot Jobs list, which accompanies its economic independence index. Today, all these jobs require post-secondary education. “There are openings, but many people don’t have the skills that are now required by these openings,” said Mary Sarris, executive director of the North Shore Workforce Investment Board in Salem. She noted that even jobs that require only a high school diploma, like machinists or electronic engineering technicians, are often filled by people with certificates or associate’s degrees. Getting an education isn’t cheap. An adult with two young children who enrolls at a Massachusetts community college part time for four years will have to shell out $21,000 for tuition, child care, and transportation, according to the Crittenton index. And living expenses are skyrocketing. The cost of transportation shot up 40 percent in the past three years, mainly due to gasoline prices, according to Crittenton, and health care soared 21 percent. The income needed by single heads of households with two young children has jumped 7 percent since 2010, according to the Crittenton report. Increasingly, poor working families seek assistance to get by. In Western Massachusetts, for instance, nearly one out of three families who visit food pantries have at least one employed adult, according to the Food Bank of Western Massachusetts, up from slightly more than one in four a decade ago. Jim and Annmarie Wilson of Chicopee both work full time but visit a food pantry a few times a week to feed their children, ages 8, 12, and 18. After Jim was laid off from a refrigeration job 18 months ago and his wife, a licensed practical nurse, lost her job a few months later, the couple declared bankruptcy and burned through their retirement savings. He found work as a janitor, and she is employed at a retirement home, but their wages are lower. He earns $400 a week — 40 percent less than at his old job. Even some families that make more than the Crittenton minimum are barely scraping by. Anne Desjardins, 39, recently got a job as a hotel revenue management analyst for $68,000 a year. The single mother of three was able to buy a condo and get off government assistance, but can’t afford to take her kids on vacation.